I don’t always buy organic. I do when I can, but sometimes I prefer to buy the local Kent or Sussex grown tomatoes if that’s what is available at the farmer’s market, rather than the organic Spanish ones at the big chain superstore, which are laden with the additional guilt of unecessary food miles and extra packaging. I shop the way my conscience tells me to, and sometimes that means that means making difficult choices. The one choice I never compromise on, however, is how my food tastes. I’m not going to buy either of those tomatoes if they taste of damp cardboard. And certainly not unless they smell like a tomato should smell; of damp earth and acidic fruitiness. Buying what’s in season usually keeps me on the right track for getting the freshest & most flavour packed produce. And, as a farmer I am not, my vegetable guy at the market always steers me in the right direction, so my general horticultural ignorance doesn’t seem to hinder me too much. Luckily I didn’t have to make any difficult choices this morning when at the farmer’s market. My fish guy, Chris, was there with his truck back full of sustainably caught sole, haddock, crab, plaice and mackerel. I bought some plaice and got the instructions on how to prepare it. Chris is a 4th generation fisherman and though I’ve not been buying from him for too long, his fish is always fresh & odour-free and I’ve found his advice to be consistently spot on. When I prepare my dinner tonight, I’ll season and flour the plaice lightly and fry it in butter, finishing it only with a squeeze of lemon. A little fennel, sliced thinly and sauteed to transparency in butter (if I still had a gallbladder, it would hate me now) and well seasoned with salt & pepper and a tablespoon of luxuriously thick and tart creme fraiche stirred in at the end, will make a beautiful and simple side dish to accompany the fish. But wait, I need to tell you more about the butter! Its Glastonbury butter! Green’s of Glastonbury are a family-run dairy farm from…well, Glastonbury in Somerset, where their organically certified herd munches on the grass around the slopes of Glastonbury Tor. They are mainly a cheese producer, but they also sell their own butter, which is sold in huge round wodges and they also make the most nutty and sharp unpasturised cheddar you will ever taste. After the amount of butter and creme fraiche in my supper, I think the cheddar will have to wait for another day, but the abundance of raspberries in season means I will still be having dessert tonight. But this time, no Greek yogurt, no creme fraiche, no drizzle of honey. 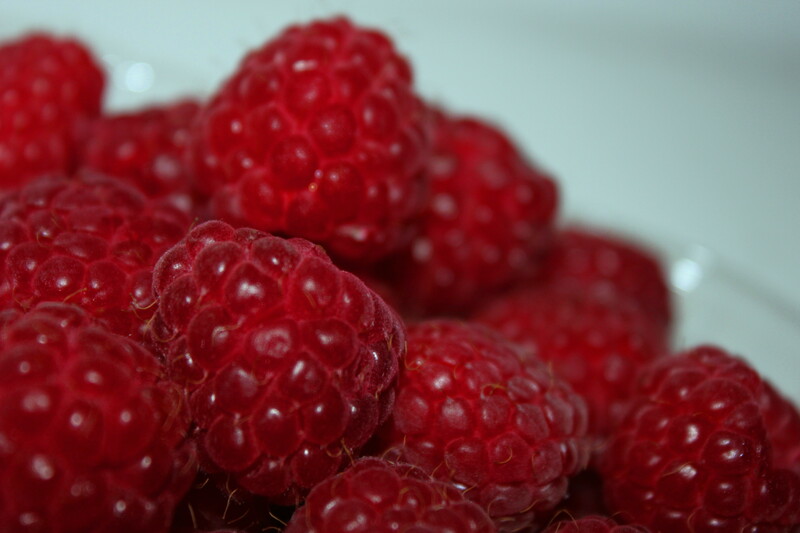 Just plain raspberries, so ripe that each drupelet bursts open and starts to melt as it touches your tongue. This entry was posted in Uncategorized and tagged baking, bermondsey, bermondsey square, butter, cheese, cooking, farmer, farmer's market, fennel, fish, fisherman, fishing, food, glastonbury, non intensive farming, organic, organic food, raspberries, samphire, sustainability, sustainable on July 9, 2011 by Our Little Organic Life.